﻿ Deep Lip Rims,2 Piece Wheels For Sale-Jova Car Accessories Co.,Ltd. 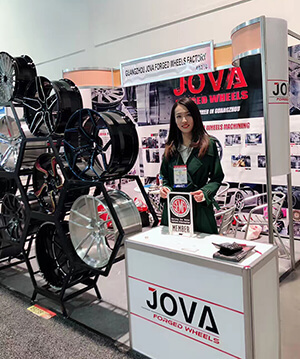 JOVA WHEELS is a china wheel manufacturer in Guangzhou city. we custom made t6 forged wheels for cars, including monoblock forged wheels, 2-piece wheels and 4x4 offroad wheels. These forged alloy wheels in first picture, are justing finish the first process, machined the wheel blank. and in the second picture, justing finish machine milling process, to make the rim spoke. The monoblock forged wheels are waiting for painting. These forged wheels are finished to paint gloss black , and now waiting to machine the spoke face, to make black machined rims. Custom car wheels , welcome to visit our factory , call or text 0086 18819367688, or email jova@jovawheels.com . JOVA WHEELS is a forged car wheels, make monoblock forged wheels , 2-piece forged wheels and 4x4 off road wheels . 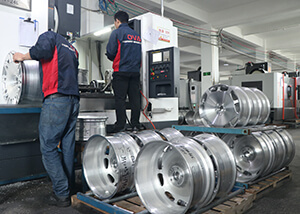 The routine work in JOVA WHEELS factory. 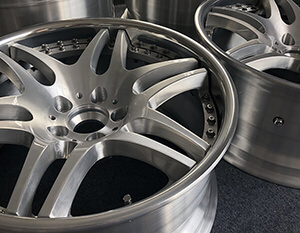 Design forged wheels: Custom forged wheels, call or text 0086 18819367688, or email jova@jovawheels.com . Happy New Year 2019 ! We will have a long holiday, for Chinese Spring Festival. Custom rims please text 0086 18819367688, or email jova@jovawheels.com . 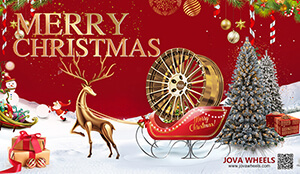 JOVA FORGED WHEELS wish you Merry Christmas ! Looking for forged wheel manufacturers, welcome to chat us. JOVA WHEELS manufacture 6061-t6 forged car wheels, available size from 16" to 22", including monoblock forged wheels, 2-piece forged wheels and 4x4 forged off road wheels. call at 0086 18819367688 or email jova@jovawheels.com . 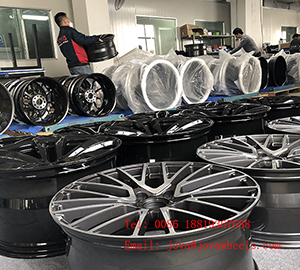 JOVA WHEELS is a custom wheel manufacturer based in China, we do 6061-t6 monoblock forged wheels , 2-pc forged wheels and 4x4 custom off road wheels rims, available size are from 16" to 22" . Our monoblock wheels available size from 16" to 22", 2-pc wheels available size from 18" to 22", and 4x4 off road wheels available size now are 22 inch. For wheels design and surface, we can custom made the spoke wheels fit your requirement. such as deep lip wheels, deep dish wheels, concave wheels, staggered wheels, 5 lug wheels, and so. 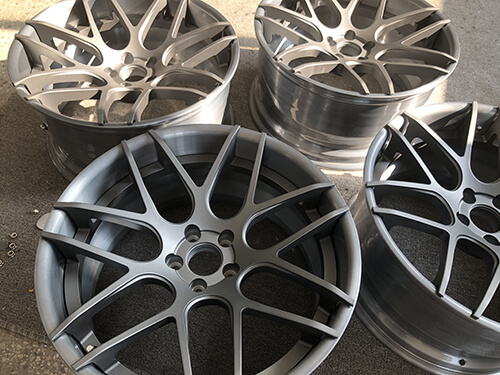 With the mass production and sale of forging wheels blanks, more forging machines and professional and technical workers, JOVA WHEELS will offer you the best forged car wheels, to fit your equirement. New custom wheels are finished in JOVA WHEELS factory. Here we will share you some forged wheels. These forged aluminum wheels are 2 piece model, the rim barrel are polished finish, and the hup cap are brushed finished. our 2 piece forged wheels, the available size are 18 19 20 21 22 inch, available width are from 8 inch to 13 inch. This 2 piece wheel, the rim barrel are also polished finish, the hup cap are black paint and the spoke are protruding. This black 5 spoke rims are monoblock forged wheels, the spoke are concave, and brushed finished. available size are 16 17 18 19 20 21 22 inch. View the new 2 piece forged wheels made in JOVA WHEELS factory. 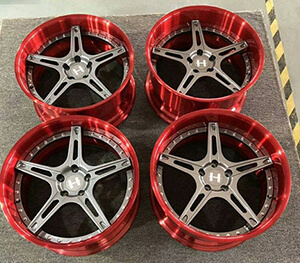 This forged car wheels are 2 piece model, the rim barrel are transprant red finish, and the hup cap are grey finish. available size from 18 inch to 22 inch, the available width size are from 8 inch to 13 inch. This forged wheels for Maserati are also 2 piece forged model, with all pink paint, staggered spoke. we also can customized made it with size from 18 inch to 22 inch. For hup cap ,the spoke, we can do it any design as you like . 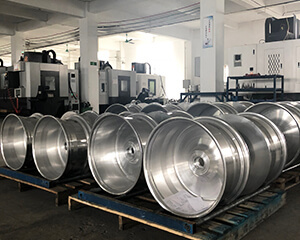 Except 2 piece forged wheels, our main business are monoblock forged wheels , the available size are from 16 inch to 22 inch, the rim width , pls check with us.